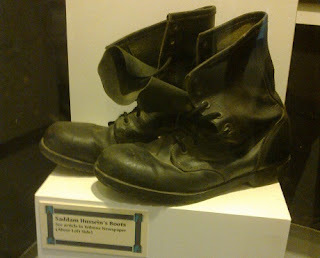 In celebration of the death of Osama Bin Laden, did you know that Utah has Saddam Hussein's boots on display? When Saddam Hussein was pulled from his spiderhole in 2004 and taken in custody, Utah soldiers brought his boots to Utah. They are on display at the Fort Douglas War Museum. Go and check them out in celebration of this historic event! For more interesting facts on Utah, visit our list of DID YOU KNOW posts.